Outside of Western cultures, men's clothing commonly includes skirts and skirt-like garments; however, in North America and much of Europe, the wearing of a skirt is today usually seen as typical for women and girls and not men and boys, the most notable exceptions being the cassock and the kilt. People have variously attempted to promote the wearing of skirts by men in Western culture and to do away with this gender distinction, albeit with limited general success and considerable cultural resistance. Ancient Hebrew, Greek, and Roman men generally wore some form of tunic. Ancient Egyptian Pharoes wore a wrap skirt known as a shendyt, which was similar to modern kilts, while the high priests wore a wrap skirt similar to a sarong. 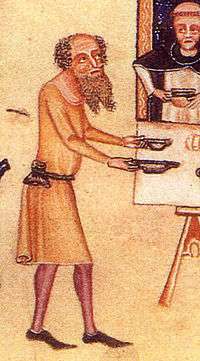 Both the Anglo-Saxons and Normans wore skirted garments, as can be seen in the Bayeux Tapestry. These fashions continued well into the Middle Ages. From the early Victorian period, there was a decline in the wearing of bright colours and luxurious fabrics by men, with a definite preference for sobriety of dress. By the mid-20th century, orthodox Western male dress, especially business and semi-formal dress, was dominated by sober suits, plain shirts and ties. In the 1960s, there was widespread reaction against the accepted North American and European conventions of male and female dress. This unisex fashion movement aimed to eliminate the sartorial differences between men and women. In practice, it usually meant that women would wear male dress, i.e., shirts and trousers. Men rarely went as far in the adoption of traditionally female dress modes. The furthest that most men went in the 1960s in this regard were velvet trousers, flowered or frilled shirts and ties, and long hair. In the 1970s, David Hall, a former research engineer at the Stanford Research Institute (SRI), actively promoted the use of skirts for men, appearing on both The Tonight Show Starring Johnny Carson and the Phil Donahue Show. In addition, he was featured in many articles at the time. In his essay "Skirts for Men: the advantages and disadvantages of various forms of bodily covering", he opined that men should wear skirts for both symbolic and practical reasons. Symbolically, wearing skirts would allow men to take on desirable female characteristics. In practical terms, skirts, he suggested, do not chafe around the groin, and they are more suited to warm climates. In the 1980s, a few male celebrities dressed in skirts, and fashion designers such as Jean-Paul Gaultier, Giorgio Armani, John Galliano, Kenzo, Rei Kawakubo, Marc Jacobs and Yohji Yamamoto tried to promote the idea of men wearing skirts, but the wearing of skirts by men remained firmly linked with ideas of effeminacy. Lead singer of Korn, Jonathan Davis, has been known to wear kilts at live shows and in music videos throughout his career of 18 years with that band. Guns N' Roses' singer, Axl Rose, was known to wear men's skirts during the Use Your Illusion period. In 2008 in France, an association was created to help spur the revival of the skirt for men. Hot weather has also encouraged use. In June 2013, Swedish train drivers won the right to wear skirts in the summer when their cabins can reach 35 °C (95 °F), whilst in July 2013, parents supported boys wearing skirts at Gowerton Comprehensive School in Wales. In 2003, the Metropolitan Museum of Art displayed an exhibition, organized by Andrew Bolton and Harold Koda of the Museum's Costume Institute and sponsored by Gaultier, entitled Bravehearts: Men in Skirts. The idea of the exhibition was to explore how various groups and individuals (from hippies through pop stars to fashion designers) have promoted the idea of men wearing skirts as "the future of menswear". It displayed men's skirts on mannequins, as if in the window of a department store, in several historical and cross-cultural contexts. The exhibition display pointed out the lack of a "natural link" between an item of clothing and the masculinity or femininity of the wearer, mentioning the kilt as "one of the most potent, versatile, and enduring skirt forms often looked upon by fashion designers as a symbol of a natural, uninhibited, masculinity". It pointed out that fashion designers and male skirt-wearers employ the wearing of skirts for three purposes: to transgress conventional moral and social codes, to redefine the ideal of masculinity, and to inject novelty into male fashion. It linked the wearing of men's skirts to youth movements and countercultural movements such as punk, grunge, and glam rock and to pop-music icons such as Boy George, Miyavi and Adrian Young. Many male musicians have worn skirts and kilts both on and off stage. The wearing of skirts by men is also found in the goth subculture. Elizabeth Ellsworth, a professor of media studies, eavesdropped on several visitors to the exhibition, noting that because of the exhibition's placement in a self-contained space accessed by a staircase at the far end of the museum's first floor, the visitors were primarily self-selected as those who would be intrigued enough by such an idea in the first place to actually seek it out. According to her report, the reactions were wide-ranging, from the number of women who teased their male companions about whether they would ever consider wearing skirts (to which several men responded that they would) to the man who said, "A caftan after a shower or in the gym? Can you imagine? 'Excuse me! Coming through!'". An adolescent girl rejected in disgust the notion that skirts were similar to the wide pants worn by hip-hop artists. Two elderly women called the idea "utterly ridiculous". One man, reading the exhibition's presentation on the subject of male skirt-wearing in cultures other than those in North America and Europe, observed, "God! Three quarters of the world's population [wear skirts]!" The exhibition itself attempted to provoke visitors into considering how, historically, male-dress codes have come to this point and whether in fact a trend towards the wearing of skirts by men in the future actually exists. It attempted to raise challenging questions of how a simple item of dress connotes (in Ellsworth's words) "huge ramifications in meanings, behaviours, everyday life, senses of self and others, and configurations of insider and outsider". The wearing of skirts, kilts, or similar garments on an everyday basis by men in Western cultures is an extremely small minority. 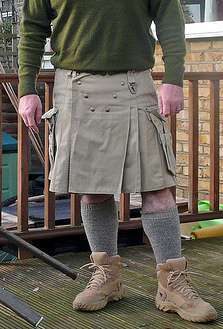 One manufacturer of contemporary kilt styles claims to sell over 12,000 such garments annually, resulting in over $2 million annually worth of sales, and has appeared at a major fashion show. According to a CNN correspondent: "At Seattle's Fremont Market, men are often seen sporting the Utilikilt." In 2003, US News said that "... the Seattle-made utilikilt, a rugged, everyday riff on traditional Scottish garb, has leapt from idea to over 10,000 sold in just three years, via the Web and word of mouth alone." "They've become a common sight around Seattle, especially in funkier neighbourhoods and at the city's many alternative cultural events. They often are worn with chunky black boots," writes AP reporter Anne Kim. "I actually see more people wearing kilts in Seattle than I did when I lived in Scotland," one purchaser remarked in 2003. In addition, since the mid-1990s, a number of clothing companies have been established to sell skirts specifically designed for men. These include Macabi Skirt in the 1990s, Menintime in 1999 and Midas Clothing in 2002. In 2010, the fashion chain H&M featured skirts for men in its lookbook. In Wicca and neopaganism, especially in the United States, men (just as women) are encouraged to question their traditional gender roles. Amongst other things, this involves the wearing of robes at festivals and sabbat celebrations as ritual clothing (which Eilers equates to the "church clothes" worn by Christians on Sundays). Some denominations (called 'traditions') of Wicca even encourage their members to include robes, tunics, cloaks, and other such garments in their day-to-day wardrobes. Outside of Western cultures, male clothing includes skirts and skirt-like garments. One common form is a single sheet of fabric folded and wrapped around the waist, such as the dhoti/veshti or lungi in India, and sarong in South and Southeast Asia, and Sri Lanka. There are different varieties and names of sarong depending on whether the ends are sewn together or simply tied. There is a difference in the way a dhoti and lungi is worn. 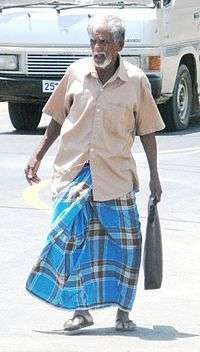 While a lungi is more like a wrap around, wearing the dhoti involves the creation of pleats by folding it. 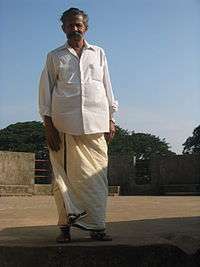 A dhoti also passes between the legs making it more like a folded loose trouser rather than a skirt. In Sub-Saharan Africa, sarong-like garments sometimes worn by men are known as kanga (or khanga), kitenge (or chitenje), kikoy, and lappa. In Madagascar they are known as lamba. The Samoan Lavalava is a wraparound "skirt". These are worn by men, women and children. The women's lavalava pattern usually have either traditional symbols and/or a flower (frangipani) pattern. The men's lavalava have only traditional symbols. In Sikhism, a faith that originated in the Punjab, there is a traditional dress which is worn by both men and women, called a 'baana' or 'chola'. This dress has a skirted bottom and is worn over long white undershorts. It was traditionally worn in battle by Sikh warriors as it allowed free movement and remains a part of the traditional Sikh dress and identity. Some long robes also resemble a skirt or dress, including the Middle Eastern and North African caftan and djellaba. 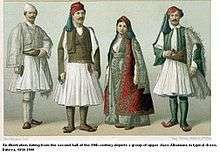 Other similar garments worn by men around the world include the Greek and Balkan fustanella (a short flared cotton skirt), the Pacific lava-lava (similar to a sarong), some forms of Japanese hakama and the Bhutanese gho. Skirts that are called qun(裙) or chang(裳) in Chinese were also worn by Chinese men in ancient times. One notable example of men wearing skirts in fiction is in early episodes of the science fiction TV program Star Trek: The Next Generation. The uniforms worn in the first and second season included a variant consisting of a short sleeved top, with attached skirt. This variant was seen worn by both male and female crew members. The book The Art of Star Trek explained that "the skirt design for men 'skant' was a logical development, given the total equality of the sexes presumed to exist in the 24th century." However, perhaps reflecting the expectations of the audience, the "skant" was dropped by the third season of the show. In some Western dance cultures, men commonly wear skirts and kilts. These include a broad range of professional dance productions where they may be worn to improve the artistic effect of the choreography, a style known as contra dance, where they are worn partly for ventilation and partly for the swirling movement, gay line dancing clubs where kilts are often worn, and revellers in Scottish nightclubs where they are worn for ventilation and to express cultural identity. ↑ "...[despite] the best efforts of designers like Jean Paul Gaultier and others, the men's skirt has failed to gain popularity (though the kilt appears appropriate wear for men on certain special occasions)." Fiona Margaret Wilson (2003), Organizational Behaviour and Gender. Ashgate Publishing, Ltd. ISBN 0-7546-0900-6, p. 199. 1 2 MS Aileen Ribeiro (2003). Dress and Morality. Berg Publishers. p. 169. ISBN 1-85973-782-X. ↑ Fiona Margaret Wilson (2003). Organizational Behaviour and Gender. Ashgate Publishing, Ltd. p. 199. ISBN 0-7546-0900-6. ↑ Jennifer Craik (1994). The Face of Fashion: culture studies in fashion. Routledge. p. 200. ISBN 0-415-05262-9. ↑ Lizzy Davies (2008-08-04). "The Frenchmen fighting for the right to wear skirts". The Guardian. London: Guardian News and Media Limited. ↑ "Sweden's Arriva lifts shorts ban for skirt-wearing drivers". BBC news. 10 June 2013. Retrieved 16 July 2013. ↑ "Swansea schoolboys keep cool in skirts after shorts ban". Daily Telegraph. 15 Jul 2013. Retrieved 16 July 2013. ↑ Bolton, Andrew (2003). Bravehearts: Men in Skirts. Harry N. Abrams. ISBN 0-8109-6558-5. 1 2 3 4 Elizabeth Ann Ellsworth (2005). Places of Learning Media, Architecture, Pedagogy. Routledge. pp. 143–146. ISBN 0-415-93158-4. ↑ "The New School: Faculty: Elizabeth Ellsworth"
↑ Craig Harris (2007-01-26). "Manly skirt is not just for Scots anymore". Seattle Post-Intelligencer (online edition). Retrieved 2007-05-18. ↑ "Escaping the tyranny of trousers". U.S. News & World Report. May 5, 2003. Retrieved 2007-05-18. ↑ Anne Kim (October 1, 2005). "Utilikilt makes 'short' work of job for men". The Ara\izona Republic (Online edition). Retrieved 2007-05-18. They've become a common sight around Seattle, especially in funkier neighborhoods and at the city's many alternative cultural events. ↑ Chelan David (March 12, 2003). "Kilts coming back in fashion" (PDF). Ballard New-Tribune. Retrieved 2007-05-18. Mackay is amazed at the amount of kilts he sees in Seattle. "I actually see more people wearing kilts in Seattle than I did when I lived in Scotland," he marvels. ↑ "Men's skirts sew success". BBC News. 2003-06-27. Retrieved 2010-05-12. ↑ Helen A. Berger (1999). A Community of Witches: Contemporary Neo-paganism and Witchcraft in the United States. University of South Carolina Press. p. 43. ISBN 1-57003-246-7. ↑ Dana D. Eilers (2002). The Practical Pagan: Common Sense Guidelines for Modern Practitioners. Career Press. p. 153. ISBN 1-56414-601-4. ↑ Lisa Lenoir (2003-12-11). "Men in Skirts". Chicago Sun-Times. The Chicago Sun-Times Inc.
Wikimedia Commons has media related to Men wearing skirts.